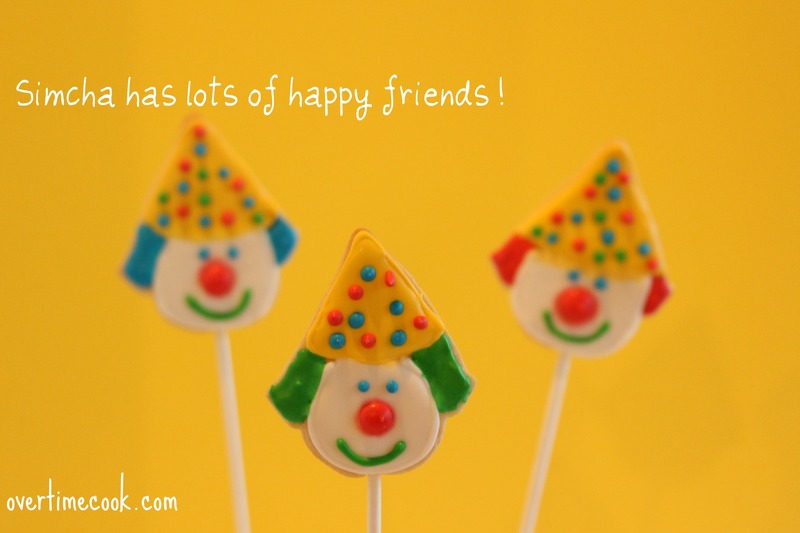 Remember my Clown Cake Pops? Well if you thought those were cute, I’ve got a real treat for you. 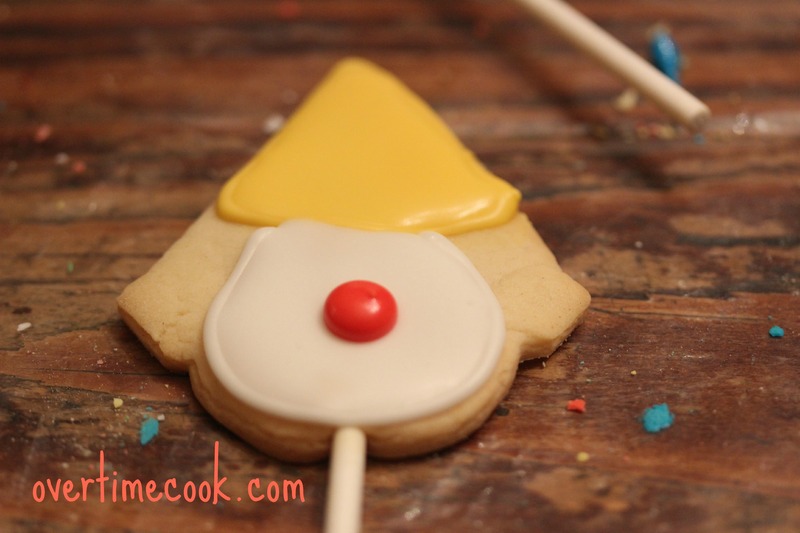 I’ve been considering doing a royal icing/sugar cookie post for a while, and finally, today I am going to take you behind the scenes to discover how to make your own little clown friend. First, let’s start with the dough. 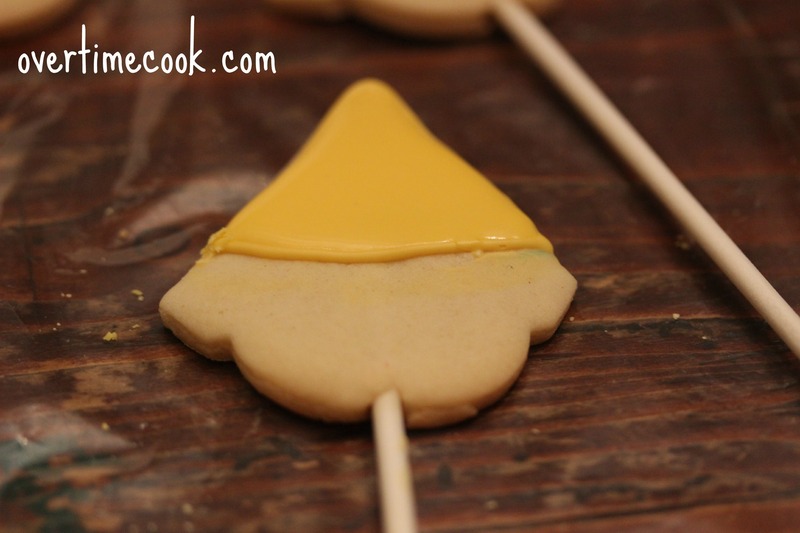 I use the King Arthur Flour decorating cookie recipe, and people really like it. If you have one you like, go for it. Scroll past the recipe for decorating how-to. In the bowl of an electric mixer, cream together the butter/margarine, sugar and corn syrup until light and fluffy. Add the vanilla extract, salt and egg/water combination. Beat until combined. Add flour and stir until flour is incorporated and a smooth dough is formed. Place dough in fridge to cool for an hour. Preheat oven to 350. Cut parchment paper to fit your cookie sheets. Spread a bit of flour on the cut parchment paper and roll out the cookies. For ordinary cookies, roll them about 1/8 of an inch or thinner. 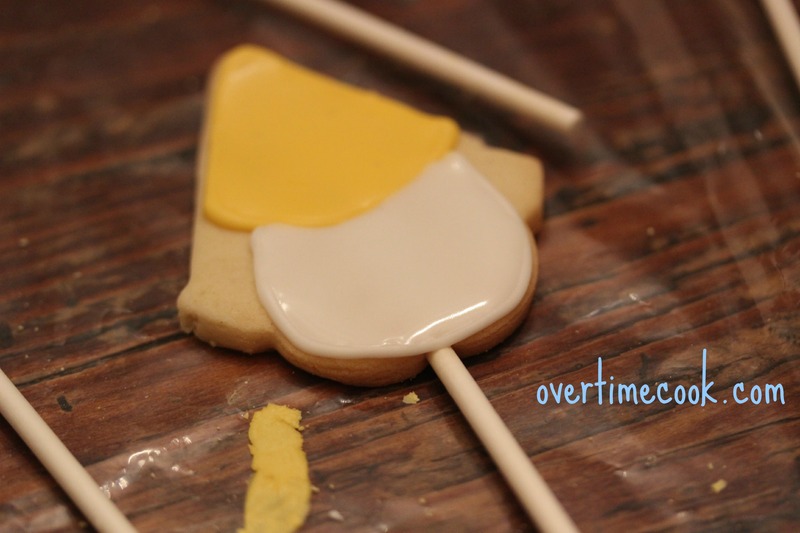 For cookie pops, they need to be a little thinner (in order to hold the sticks- see below.) Rolling the dough directly on the parchment will ensure that the cookie shapes don’t get damaged when being moved from the rolling surface to the baking tray. Cut the cookies out with your cookie cutter. Remove the extra dough and put back in the fridge to re-roll at the end. 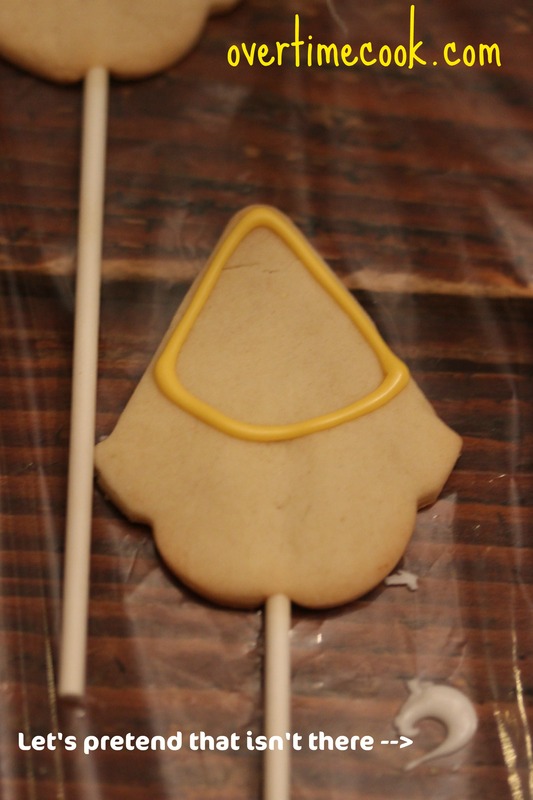 If desired, place a lollipop stick in the center of the bottom side of the cookie. Bake the cookies at 350 for 8-12 minutes, until edges are just turning golden brown. 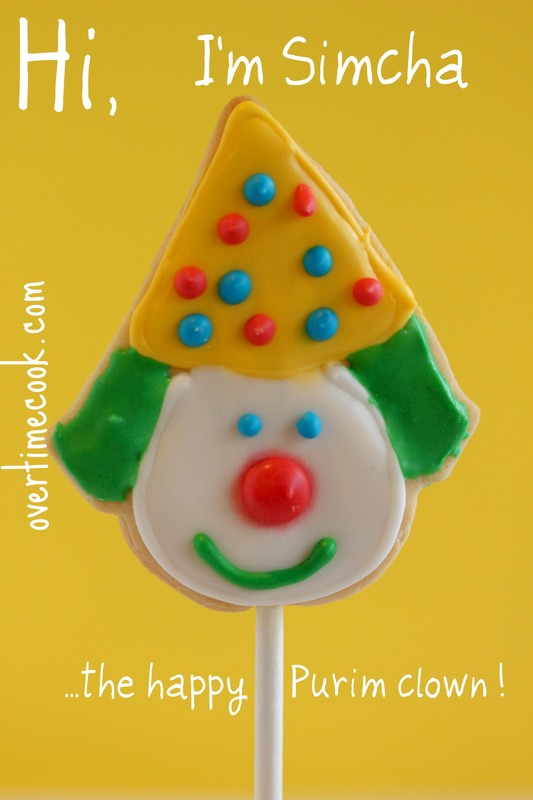 (Length of time depends on the thickness of the cookie. Remove from oven and cool completely on a wire rack before decorating. Combine confectioner’s sugar and meringue powder together in the bowl of an electric mixer. Add the water, (starting with Tablespoons and add additional tablespoon if needed.) and beat thoroughly. Mix for about 8-10 minutes, until icing no longer looks shiny. Once you have your rolled, shaped, baked and cooled cookies, it’s time to decorate. 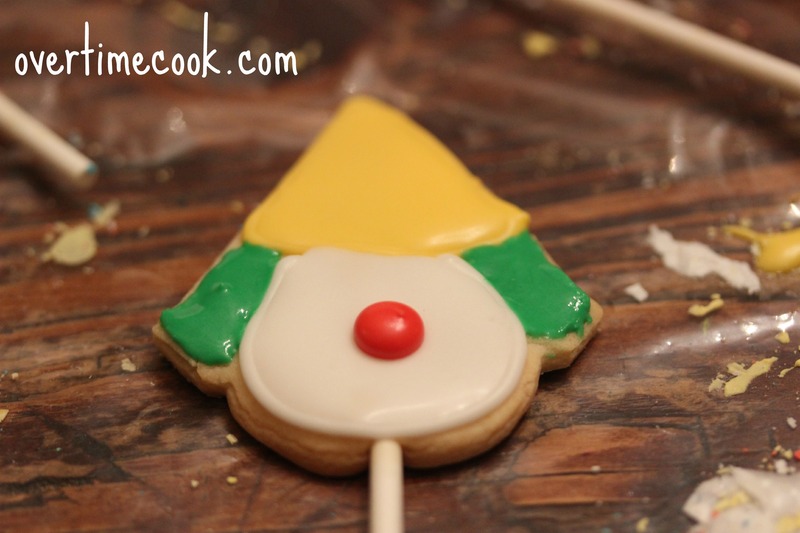 There are many comprehensive tutorials on decorating cookies on this wondrous world wide web. This isn’t one of them. I am going to show you the basics, but if you’ve never done it before, I urge you to check out some of the experts, such as Bake at 350 and Sweetopia. And of course,check out my incredibly talented friend Paula, AKA Vanilla Bean Baker, who just happens to be one of my favorite blog readers/blogging pals, in addition to being an extraordinary cookie decorator. In the directions below, I am going to give you some basic guidelines, and also show you how to make some friends for Simcha the clown. First, my amazing brainstorm: if you can’t find a clown shaped cookie cutter, fear not. I used a…get this – ice cream cone shaped cookie cutter! Yep, I turned it upside down, and made the cone into a hat for my little clown friend. The scoop becomes the head, and the little bits on the side are perfect for his hair. If you want to make a cookie pop instead of an ordinary cookie, roll them a bit thicker, then stick the lollipop stick into the middle of the bottom of the cookie. It’s not as confusing as I just made that sound. I promise. You will need the most of the yellow and white, as those are your background colors, some red, for the noses, and a bit each of blue and green for decorating. Note: Be creative! My pictures are just a suggestion- but have fun decorating these! Make sure, however, to plan your icing accordingly. In this step, you pipe a thin line of thicker icing around the edge of the area you will be decorating. 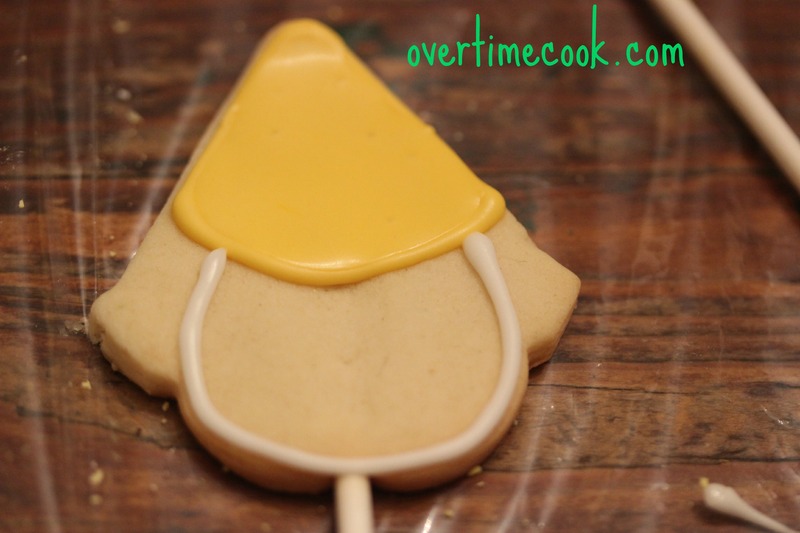 When you flood the cookie (step 2), this line acts as a dam to hold the icing in place. It is probably considered “correct” to outline the entire cookies, wait till it dries, then flood it. I didn’t do it that way. In the flooding step, you add a bit of water to the icing, making it easier to fill in the outlined area. Add the water a few drops at a time to ensure you don’t make it too thin. If you have a squeeze bottle, use it to pour icing into the center, then spread with a toothpick. Once your cookies are completely dry, it’s time to move on to step 3: decorating. And some hair. At first I outlined and flooded this section, but then I discovered that it was too small an area, so I piped the thicker icing over the entire area. Now you can decorate however you please! Give him a mouth, some eyes, don’t forget to decorate the hat! Not to promote myself or anything, but I just made a Facebook Page for this blog, and if you make these cookies, or my cake pops, or really any of my recipes, I would love for you to upload pictures and share them with me! These are adorable! Perfect for Purim. Just looking at them is making me happy! Awesome pics, btw. Those are SOOOO ADORABLE! Now I need a reason to make them, those are definitely cookies that should be shared! These are so cute! Their hats are fun! These are absolutely precious! My kids would love to get something like this! Someday, when I’m feeling ambitious, perhaps I will try these!